I’ll admit it: as hard as I may try, I am absolutely terrible in the kitchen. It’s not that I can’t make things that taste good; give me some chicken and a slow cooker, and I’ll make tacos that blow your face off. But if you put me in charge of a full meal, you’ll end up with 3 or 4 things that would have tasted great had I not burned them to hell. Last week I attempted to make a grilled cheese sandwich and a smoothie, and got so distracted with finding the perfect smoothie texture that I ended up burning the damned grilled cheese sandwich. I’ll repeat that: I screwed up grilled cheese. If only this kitchen timer concept from Yonko Design was real, my culinary woes would be a thing of the past.They’ve taken the concept of a recipe card and the concept of a kitchen timer and slammed them together in a way that is just way too obvious. 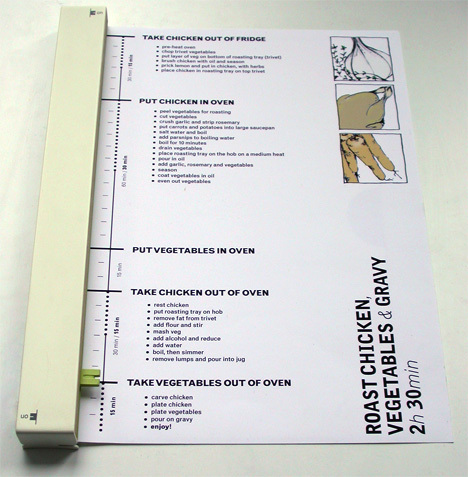 Plop the recipe card into the holder, and start the timer. As the timer progresses, it aligns with marks on the paper for each step, ensuring that you’re doing everything exactly when the recipe author intended. As long as you can keep your eyes on the recipe sheet, you won’t burn the grilled cheese.